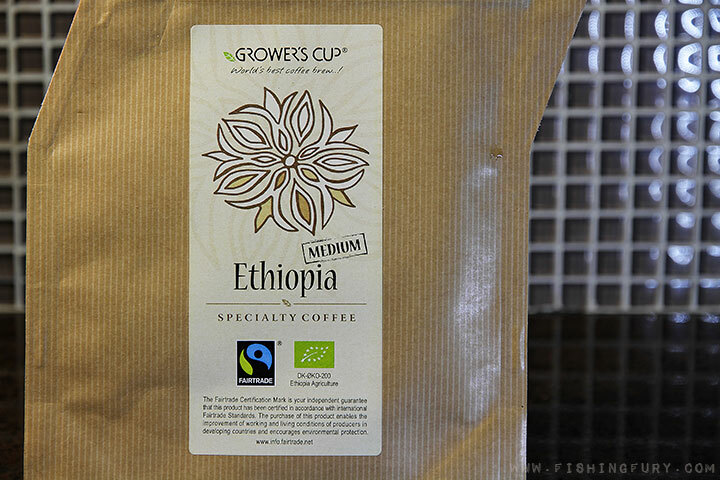 The Coffeebrewer – Grower’s Cup | Fishing Reviews | FISHING FURY - A Fishing Blog with Attitude! 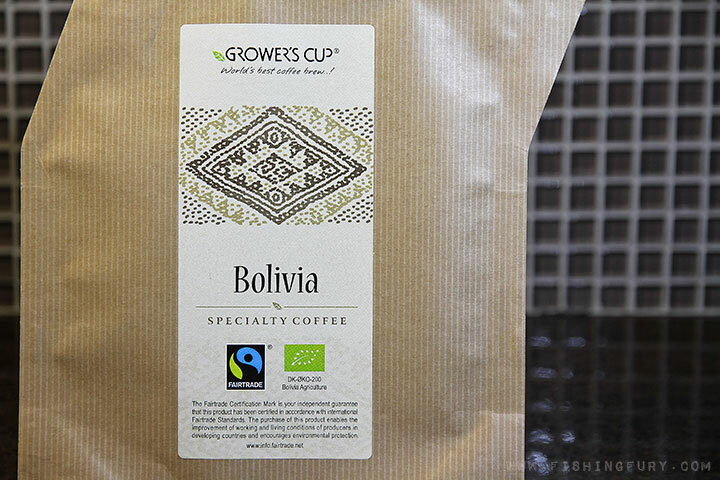 Grower’s Cup is a micro roasted specialty coffee in a creatively designed brew packaging. 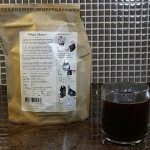 This disposable hybrid packaging is said to be somewhere between a traditional filter dripmaker and a french press. To brew you simply add boiling water right to the pouch, wait a few minutes, and pour out your coffee through the built-in spout. It sounds like a great way to enjoy a cup of non-instant coffee on the trail or while camping so naturally I was very excited to test them. 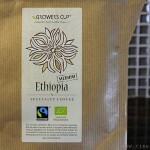 There are several factors to creating the perfect cup of coffee. 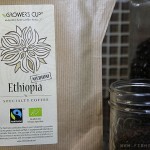 Of course you’ll want to use the freshest possible coffee grounds, but water quality, water temperature, grind size, and brew time all have a huge impact on the end result. 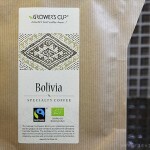 On the backside of each Grower’s Cup package you’ll find some information about the coffee inside, instructions on how to brew, the best before date and the pack date. 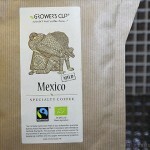 This is the date when your coffee was ground and packaged, the closer this date is to the date you make your coffee the better, though the best before date suggest a shelf life just over one year. To brew your Grower’s Cup coffee open the top of the packaging to expose the grounds and brew-in liner. The aroma of coffee should begin to find its way to your nose and when it does I think you’ll be quite pleased. 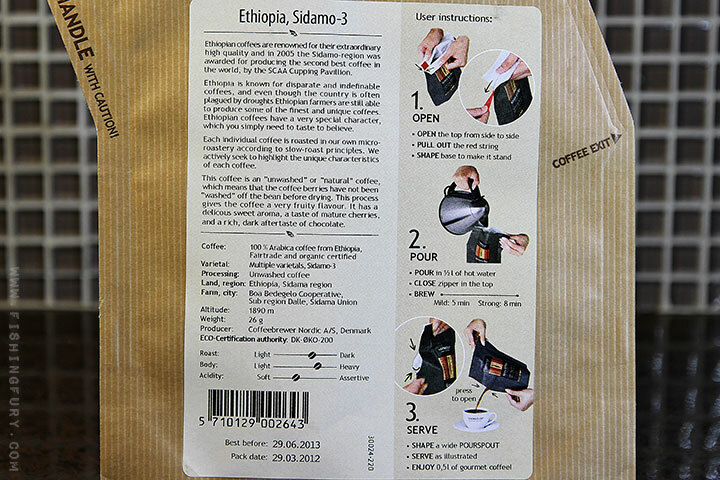 Shape the bottom of the packaging to create a stand and prevent the bag from tipping over. 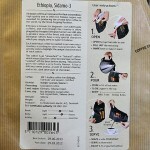 Pour in 500ml of boiling water, pinch closed the top of the bag and leave to brew (see backside as brewing time may vary). Once the brewing is complete, pull out the ribbon to open the pouring spout and adjust the packaging to shape a wide spout. Firmly grab the top back end of the packaging (there is a small hole in the packaging which makes this easy to find) and just below the spout. The first time you pour can be a little confusing, be careful the coffee is very hot. It helps to pour on an angle to avoid dripping on your hand. The packaging, while ingenious, is not without its faults. Pouring can be a pain, and I mean that literally as I burned my hand more than once. Some coffee drinkers may also be put off by the grounds and sediment in the bottom of their glasses, but this is typical of a french press. 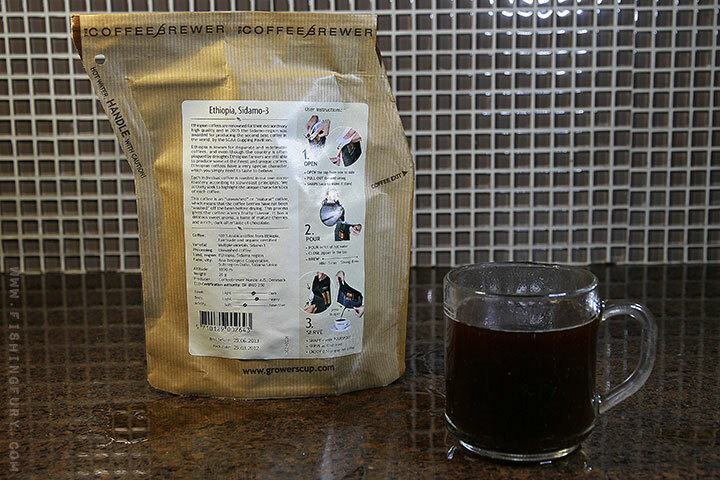 The instructions call for a brew time between five and eight minutes, but I found that brewing for even five minutes made for a very strong coffee, and my test subjects did not have good things to say. For us the perfect brew clocked in at only four minutes, so some experimentation may be required on your part to get your perfect cup. 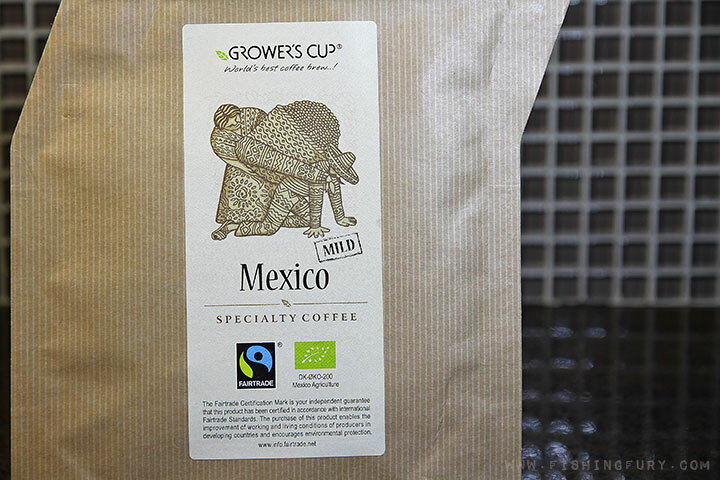 Each Grower’s Cup package of fair trade specialty coffee sells for $3.50, which is $1.75 per cup since it only makes enough for two. I tried brewing a second batch and the results were very watery and underwhelming, so you won’t get more than a single use. Grower’s Cup is probably more suited to day trips and short hikes where you might enjoy a brewed cup at your destination, but for multi-day backwoods camping it simply doesn’t fit the bill. While the packaging may be flat and easy to pack in your gear the dry weight comes in at just under two ounces, and wet it can be over three. So if you’re in a situation where you need to carry everything out, including your garbage, the extra weight might not be worth it. Overall Grower’s Cup wasn’t bad once I figured out my personal brew timing, but I don’t really see how it fits into my lifestyle. At home two cups is never enough and in the backwoods there are super lightweight instant alternatives. I’m sure there are coffee aficionados and purists who would scoff at the idea of instant coffee anywhere, even in the backwoods, and to them I would suggest this product. 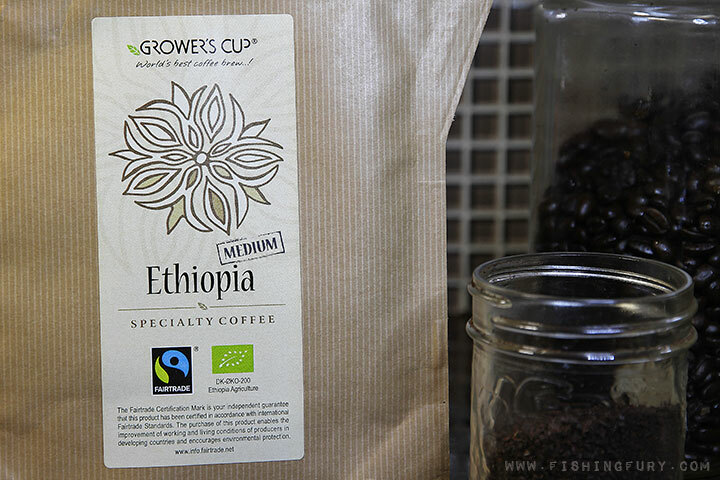 Grower’s Cup makes 2 cups of strong black coffee at home, on the trail, anywhere. Brew time for your perfect strength coffee may take a few attempts, but in the end the results are flavourful. Good for day trips, recreational vehicles, car camping, and coffee purists on the go.